The Princeton Christian Fellowship (PCF) was begun in 1931 as the Princeton Evangelical Fellowship (PEF), a name under which it operated until 2017. The need for the PEF arose out of the collapse in 1930 of the Philadelphian Society, which had been the locus of evangelical Christian student activity since 1825. The term evangelical, which accurately describes the theological commitments of the Philadelphian Society, the PEF, and the PCF, means a commitment to the authority of the inerrant scripture, an emphasis on personal conversion, and that salvation is found through the atoning work of Christ alone. As Princeton University itself moved away from these theological commitments during the course of the 1920s, the Philadelphian society, which was an official arm of the university, ultimately dissolved. That absence of organized evangelical student ministry led the mother of one Princeton student to ask Donald Fullerton, a graduate of the Princeton class of 1913, to start meeting with her son and other interested Princetonians starting in the fall of 1931. Dr. Fullerton, as he became known after receiving an honorary doctorate from Grace Seminary, was a typical Princetonian of his era, a son of privilege raised on an estate in northern New Jersey. It wasn't until his time serving with the 313th Field Artillery in the Meuse-Argonne Offensive of WWI that Fullerton became serious about the Christian faith. It was in seeing men he knew and cared about die before his eyes that Fullerton came to the end of himself and to confess Jesus as Lord and his only hope. After the war, Fullerton spent time as a missionary with the Plymouth Brethren on the northwest frontier of what was then British India, now the border region of Pakistan and Afghanistan. He was forced to return to the United States due to ill health but was determined to return, and set sail from New York harbor on the RMS Mauretania on November 27, 1929. As the ship left dock he prayed, before falling asleep, that God would turn the ship around if it wasn't His will that Fullerton return to India. While still in harbor, the Mauretania collided with a train ferry with no casualties, but was nevertheless forced to return to port. Finding the ship turned around, Fullerton remained in New Jersey, determined to send others to the mission field in his place, and within two years found himself starting up a new work at his alma mater. The report in the New York Times of the collision that turned Dr. Fullerton's ship back to port. "Dr. Fullerton was constantly about his Father's business. When he met a new student, it usually did not take more than thirty seconds for him to get on the subject of Jesus and the gospel. Then Fullerton would talk with the student as long as possible and necessary, to discern his spiritual condition, to present the gospel, to answer questions, to urge a decision. When we students sought to lead others to Christ, our main strategy was usually to maneuver them into a situation where they could have a good talk with Dr. Fullerton. Not every student who talked with him was converted, but many were. It seemed to us that, humanly speaking, if anyone could get the gospel through to a Princeton student, it was Dr. Fullerton... the greatest part of [PCF] was the godly example of Donald B. Fullerton. He was not a perfect man, but I am yet today an imitator of his, since he imitated Jesus." Donald Fullerton continued his leadership of the PCF until 1975 and continued to attend prayer meetings until the age of 88 in 1980. One of the hallmarks of Dr. Fullerton's ministry was meeting with students one-on-one, a practice that became a central part of PCF's approach to discipleship, with all undergraduates being offered a personal hour, a weekly meeting with a member of the staff to work through scripture and life. He went to be with the Lord at the age of 92 in 1985 and is buried in the Princeton Cemetery. On his tombstone is written Philippians 3:10, "That I may know him, and the power of his resurrection, and the fellowship of his sufferings, being made conformable unto his death." The PCF in 1960 (L-R): William Bryant '60, Ray Chao '61, Steve Johnson '60, Don Youngren '61, Ron Fisher '60, Hank Bryant '63, John Frame'61, Jim Renick '60, Suthy MacLean '58, Ken Petzinger '63, Bob Shade '60, Ron Furst '63, Bruce Higgins '60, Bart Campbell '62, Jerry Butler '60. Six became missionaries and one a theologian. The most significant period of change for PCF was the 1970s. Up until the inauguration of coeducation at Princeton in 1969, PCF had reflected the university at large in that it was made up exclusively of men, almost all of them white. Moreover, PCF was typically 30 members or fewer, with pictures showing groups of men in suits singing from hymnals and engaged in serious study of scripture. Fullerton was renowned for only serving one type of meal, hamburgers and beans, to the many students he had to his home behind McCarter Theatre over the years. While the student body was nominally majority Christian through those early decades of PCF, relatively few of the prep school kids who populated Princeton in that era were from evangelical churches and a large percentage of the students in PCF had been personally converted by Dr. Fullerton. 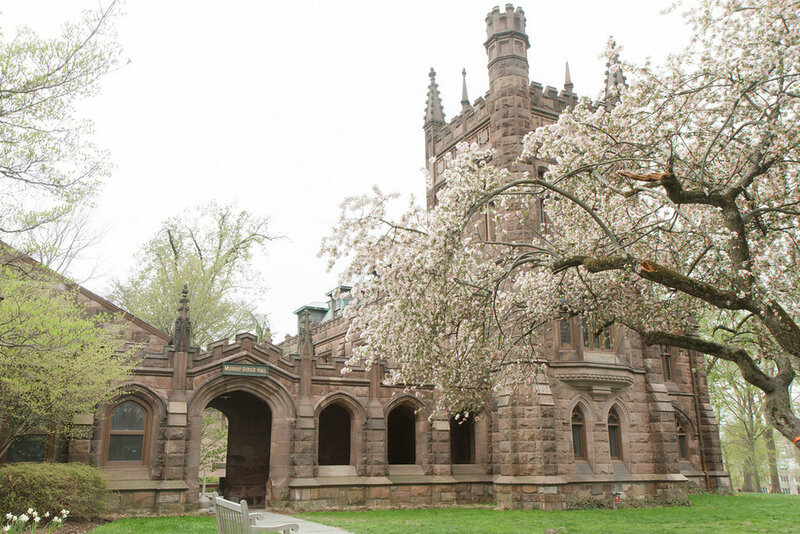 Coeducation, and the diversification of the admission pool at Princeton beyond elite prep schools, brought dramatic change to PCF's look and style, even though the theology remained unchanged. The 1970s saw PCF gain its second director, Wayne Wever '65, who, along with his wife Carol, renowned in equal measure for her skills in hospitality and matchmaking, brought in PCF traditions like the winter retreat, the talent show, elaborate social events, and the habit of PCFers marrying each other. The Wever era also saw the advent of contemporary Christian music with guitars and song sheets displacing hymnals and the organ. PCF benefited greatly from the newfound racial and ethnic diversity of Princeton, with significant growth in numbers being driven in part by believers from immigrant backgrounds, especially those from China and Korea. Wayne Wever moved on from serving as PCF director in 1996 to make way for, Bill Boyce '79, who alongside his wife, Debbie '79, continues to lead the ministry. Recent years have seen the advent of a graduate student ministry, GPCF, which has alumni serving on the faculty of schools including Harvard, Cornell, Notre Dame, Wheaton, Baylor among others. Some of the graduate alumni use the opportunity provided by their Princeton degree to gain access to countries closed to the gospel. Another recent change is an outreach called Questions for Quesadillas (Q4Q). In former years PCF was well known for going door-to-door sharing the gospel. Over time that form of outreach seemed less and less fruitful. Q4Q provided an answer to our desire for a more effective form of campus outreach. The concept is an adaptation of an outreach at Oxford and Cambridge experienced by PCFers studying abroad called Text a Toastie. Simply, in exchange for a question about faith, two PCFers will bring a free quesadilla and an answer. We find the campus far more receptive to genuine discussion of faith than one might fear and in a typical weekend when doing the outreach answer 80 or 90 questions.